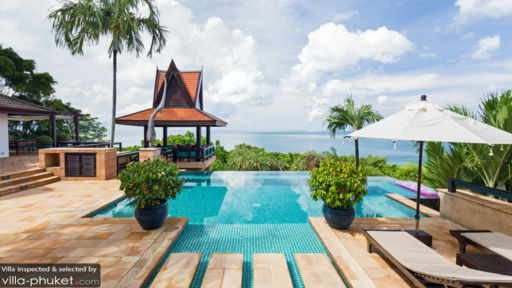 Baan Hen Kata is a cluster of two pavilions epitomizing the aesthetic blend of traditional Thai architecture and contemporary tropical elegance. Interiors are appointed with furnishings, fixtures and pieces displaying an array of design categories – finely finished stylish, beautifully crafted woven as well as elaborate wood, and in-vogue lavish. Amenities are discriminately five star – for all-out guest delight and enjoyment. Atop a hill ascending from Kata Beach, Baan Hen Kata, truly, affords you upland vacation living with an ambience that’s, most certainly, upscale. The villa has five air-conditioned bedrooms. The master bedroom, in a second-floor individual pavilion, has a stylish, four-post bed, a dedicated bathroom with a sunken bathtub and a rain shower, as well as a study. This bedroom has direct access to the infinity pool. One guest room, on the ground floor, also has a stylish, four-post bed, as well as a dedicated bathroom with a sunken bathtub. This guest room also has direct access to the infinity pool. Three other guest rooms, also on the ground floor, all have twin beds. Only one of these bedrooms has a dedicated bathroom. The two other bedrooms share one bathroom. Both bathrooms have rain showers. Although one of these two bathrooms also has a fitted bathtub. 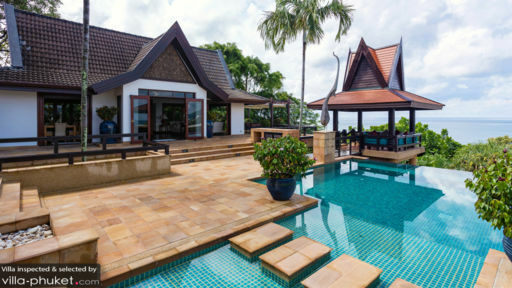 Along the edges of the two-storey property are tiered infinity pools – one of which has a built-in jacuzzi. Give in to their beckoning, glassy waters and wade to their scenic sides where you’ll certainly linger – entranced – as you gaze out to the Andaman Sea. For some sun, you can lie on cushioned, wooden pool beds partially covered by large umbrellas on the second-floor infinity pool’s stone deck. But as soon as the rays begin to burn, retreat to the shade of the ground-floor, poolside sala and recline on its wooden benches. On the sunny and airy second floor of the main pavilion is the living area with its large sofa and chairs. Here, you can all converge for moments of family or friendly bonding. There are two dining areas. The indoor dining area – with its beautifully crafted, wooden table for 10 – is on one side of the common space. The alfresco dining area – with its elaborate, wooden table – is under a pergola on the balcony of the second-floor main pavilion. Wherever you choose to dine at, you can all have your fill of authentic Thai specialties – as well as foreign fare – freshly cooked by the onsite chef at villa’s well-equipped and modern main kitchen on the ground floor. The villa also has a TV lounge where you can all anticipate the new episode of the latest blockbuster series. Or, relive the drama of your most beloved classic movie. Up on the second floor is a sala with 360-degree views of both the seascape and the landscape – ideal for sunset cocktails, after-dinner as well as winding down drinks, and also for meals. In charge of carrying out the day-to-day services of the villa is an efficient and friendly staff composed of a chef, a pool attendant, a gardener, as well as housekeepers. 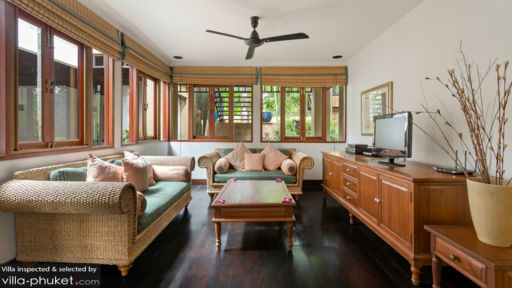 Baan Hen Kata is located within the vicinity of Kata Beach. Spend a day at its beautiful white sand stretch – swimming or simply chilling out at Kata South’s cafes and restaurants. Highly recommended are Capannina, Boathouse and Villa Royale. Move on to Surf House Phuket where more water fun awaits. On another day out, play mini golf with a pre-historic setting at the Dino Theme Park. Then experience, first hand, the exhilarating night life at Kata Center. I cannot say enough good things about Baan Hen Kata. The villa is absolutely INCREDIBLE and the views are STUNNING! It's the perfect location - removed from the hustle and bustle, but with Kata Noi and Kata towns just a short walk away. We were made to feel at home as soon as we arrived, and the staff and villa manager were just amazing throughout our whole stay, always going the extra mile and making such a fuss of our twin babies. The home cooked food was delicious, and dining at the outside dining table was better than eating out at a fancy restaurant, both in terms of views and ambience. We had such a fantastic holiday, and made some very special memories, and we cannot wait to return!